Organizational expert Dr. Brett Richards offers practical tools for business leaders to measure innovation capability, accelerate growth, and strive for success. Learn from Dr. Brett Richards, a seasoned practitioner with over 20 years' experience in the area of individual and organizational effectiveness. Leaders are challenged to differentiate themselves from their competitors, and current methods of understanding an organization's ability to grow are outdated. 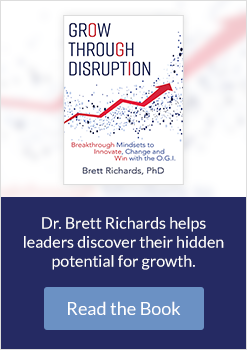 In Grow Through Disruption: Breakthrough Mindsets to Innovate, Change and Win with the O.G.I, Brett Richards offers a new system for businesses to adapt to the changing landscape. After concluding that the most important data to an organization's success is invisible and intangible, Brett Richards developed Organizational Growth Indicator (O.G.I. ), allowing managers to make more intelligent decisions and, ultimately, strengthen their businesses. Harnessing decades of experience, Grow Through Disruption: Breakthrough Mindsets to Innovate, Change and Win with the O.G.I is an essential read for heads of global corporations to leaders of small and midsize businesses. Grow Through Disruption: Breakthrough Mindsets to Innovate, Change and Win with the O.G.I, by Brett Richards, PhD (published by Clink Street Publishing on November 28th, 2017 in paperback an ebook) is available to purchase from online retailers including Amazon and to order from all good bookstores. The goal of organizations and the goals of innovation are most often the same and yet the two are experienced by organizational members as enemies, not allies.